I apologize for the lapse in posting, but I just returned home from a trip to Portugal. More specifically, I was on the island of Madeira, the island where my mother grew up. It was a fantastic trip and my mother’s cousins where generous and gracious hosts. I knew I would make a cupcake to commemorate the trip and I knew it would involve Madeira wine. I decided to pair the wine with chocolate for sure. I was keeping a lookout for one other local ingredient to use in the recipe and a trip to the Curral das Freiras, or Corral of the Nuns, provided me with some chestnut puree. Chestnuts are abundant in this area and a visit sure shows that. There were all things chestnut for sale there – syrup, cake, soup, you name it. I had one more decision to make when devising this recipe and that was which cheese I would pair with the puree to make a frosting. I was leaning towards something tangy to balance out the earthiness of the chestnuts. I chose a fromage blanc from Cowgirl Creamery. It is indeed tangy with a texture similar to fresh ricotta. I think it’s choice is a matter of taste – I will admit it pairs somewhat strangely with chocolate – but I want to give it more time to sit and for flavors to meld. I will report back on whether ricotta, which is much sweeter, might be a better choice. Update: Well, all in all, the cupcakes tasted very good, but ultimately I found the tang of the cheese a bit overpowering for the chestnut. I would try this again with ricotta or some other milder, sweeter cheese. I also updated the assembly instructions with some lessons learned. 1. Add Madeira and sugar to a medium sized saucepan. Over medium-high heat, stir until sugar dissolves. 2. Boil until liquid is reduced to a syrupy consistency, stirring occasionally, about 20 minutes. 3. 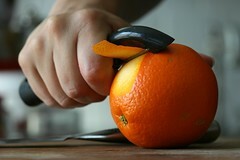 Let cool for a minute then stir in orange peel. Set aside to cool completely. 1. Beat cheese briefly, scrape bowl. 2. Add the chestnut puree and sifted powdered sugar. Beat until combined. Note: I purchased the chestnut puree in Portugal. It’s a simple mixture of chestnuts and sugar. I have seen similar products in Italian grocery stores. Otherwise, roast some chestnuts and puree with raw cane sugar in a food processor until creamy. 1. 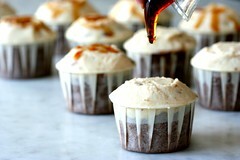 Drizzle glaze over the top of the cupcake to moisten and flavor the cake. 2. 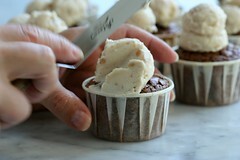 Scoop frosting onto cupcakes using a small ice cream scooper. 3. Starting from the top of the mound of frosting, smooth down to the edge of the paper with a small pallet knife. 4. 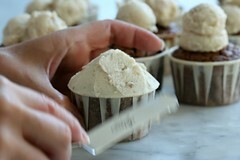 Smooth off the top of the point of frosting, providing a flat top for decoration. 5. Drizzle with glaze and top with silver dragees, candied orange rind or some other decoration. [Note] Drizzle glaze before serving as it does become absorbed in the frosting over time, else omit the second application of glaze. Note: Silver dragees, or bolas prateadas in Portuguese, are seen on many Madeiran desserts. I brought some back with me for a final “topping off” of my homage to the trip. Wow,sounds like a great trip. It’s always fun to bring the flavors home with you. How I have missed reading your creations but this one is more than fantastic!! I had just made a chocolate chestnut cake with the chestnut puree in the cake batter – bad decision on my part because the chocolate overpowered the chestnut. Your idea of having them as partners in different components is soo clever. Must give it a try soon. So beautiful! Thanks so much for showing your frosting technique! do you know what you should do? You should bring yourself and your cupcakes and start the Cupcake movement in Portugal. 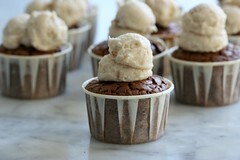 im drolling over yr cupcakes now..
your blog is always such a treat to read! i hope to try out some of your recipes soon! bake on! A group of friends and I get together once every couple of weeks to have port/madeira tastings and I think these cupcakes would be a great surprise next time we meet. I can’t wait to make them! Cheryl- You are incredible! Now, serve the cupcakes on Madeira lace, and you will be set!!! Maybe on a majolica platter! You have outdone yourself this time- these would be wonderful for a dinner party…! !Keep up the good work- we love you! this is a lovely blog! simple yet rich in information with a topping of just the right amount of pictures. keep up the great work! btw, do you come up with your own recipes? Made some cupcakes using the chocolate cupcake recipe in this (and other) posts :) I thought I was going to be feeding 10-12 people that night and as many tomorrow so I doubled the recipe – wow! Got 4 dozen baked and still have half the batter in the freezer. Ended up only feeding 6, and still went through 2 doz! 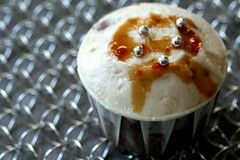 I went through your amazing cupcake recipes on your blog. I’m trying to bake some basic cupcakes from various recipes but I have one big problem. Your cupcake’s frosting is really nice and looks quite thick. But as much as I try I cannot achieve this consistency. I’m always beating it for quite a long time but it is still leaky and does not keep any form. Do you think there could be a problem with the room temperature? Is the frosting keeping the form also in the hot summer? Or do you follow any special procedure making it? this site is amazing. i found you via yahoo picks. i love cupcakes, so i’ll be back for more yummy eye candy. Chockylit, how do you think marscapone would work instead of the fromage blanc? Do you think the texture would be too “off”? Welcome back, BTW. What a beautiful cupcake. The flavors sound so interesting together. I also realy love your step by step photos. It’s amazing that you take the time to shoot while you’re making these. Booze and cupcakes…ahhhh…there IS a perfect in this world. Beautiful! these look heavenly! anw..i have a question. everytime i bake cupcakes i end up with slightly pointed tops so i have to slice them off but yours are always very nice and flat..how do u get them so perfect?? miss cupcake, sorry I was gone for so long! I found the same thing with the cheese. The chestnut is fairly subtle, and even a somewhat tangy cheese was too much for it. Lessons learned! Thank you, deb in sf! Thank you so much, kelpkim, cupcakes are so much about memories. It’s interesting that chestnuts were for you, too! Thank you so much, kate! Madeira lace… how great! Wow, Persian Pen Name, sounds like they went over well. Hi, evinka, I responded to your email with much the same. I normally don’t have trouble, but it is normally cool in SF. We did have a very hot weekend when I made these and I didn’t have any trouble getting a fairly stiff frosting. I did chill it slightly before piping, but it wasn’t necessary. I am wondering if you are adding enough powdered sugar? Also, it definitely needs to be the “powdered” or “confectioner’s” sugar and not granulated. Thanks, holly. Your blog is fantastic! Totally the stuff I go for. Hey, arti, that’s awesome. 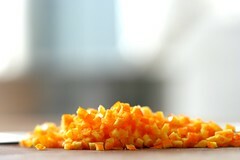 Lovely blog – I love the design of it and the recipes look delicious. Looking forward to more posts! Anonymous asked, “Chockylit, how do you think marscapone would work instead of the fromage blanc? Do you think the texture would be too “off”?” I think the texture would probably be fine, but I have the feeling I would need to add more powdered sugar than with something thicker like fromage blanc or ricotta. Should be fine, otherwise.. I would have to experiment. Thanks, nyasha. I was so planning on making cupcakes in Portugal, but it just never worked out. Oh well! Maybe next time. Thanks so much, Chubby Hubby, you continue to do such beautiful work. Always an inspiration! It definitely takes time to stop and take photos while working, but once I get the tripod/shot set up, it goes fast. I definitely want to do more and more step by step stuff as I think it’s the most helpful. Hi – Anonymous – a stick of butter is 110 grams give or take. Hope that helps. diva. – I use the Magnolia ones a lot, too. Never the Nigella, though. (Love her, but haven’t purchased a book yet.) I would check on the over temperature if you haven’t. I will do some research and see if I can find any other potential causes. Am I reading this correctly? A blog all about cupcakes?? I think I am in love! Hey we had lunch together Saturday at blogher. What a fabulous site!! Beautiful pictures, and you have elevated the cupcake to a status higher than I imagined it could hold. It was great to meet you and I am so happy to have found your site. Hi, Lisa, it was nice to meet you, too. I am going to have to leave a comment on your last post. I acted like a big idiot at blogher, too! Great photos too! I don’t know how you food bloggers get to be such great photographers as well… I hope I evolve into one. Hi, just letting you know that the list of food bloggers has been posted at my blog and also at Blogher. (I screwed up your url and I’m fixing it now. Sorry about that!!) Fun meeting everyone. oh wow!!!! looks amazing. Im sure it tastes just as amazing as it looks! How fun to hear that your mother grew up on Madeira Island and that you just visited there. I went there once when I was on a cruise. I only got to stay there a day, but I was completely captivated by the place. The flowers!! The gorgeous men! All those red-tiled roofs. I’d love to go there again when I could stay for a few weeks.